Foreign minister Sergey Lavrov met with DPRK leader Kim Jong Un in the North Korean capital on Thursday and invited him to Russia, the country’s Ministry of Foreign Affairs (MFA) announced. “Do come to Russia, we will be very glad to see you,” Lavrov reportedly told Kim Jong Un. 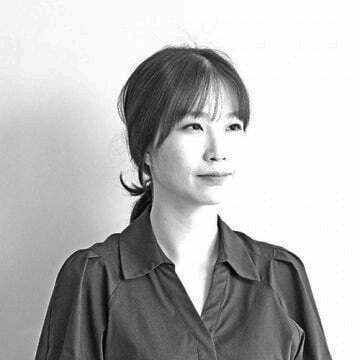 Whether Kim Jong Un has accepted the invitation remains unclear. Should he choose to go, it will represent the first visit by a North Korean leader to Russia since Kim’s father, the late Kim Jong Il, visited in August 2011. Putin previously invited Kim to Russia in 2014 – a visit Kim reportedly canceled at the last minute. Thursday’s meeting between Kim and Lavrov took place at the Paekhwawon State Guest House in Pyongyang, the Kremlin-run TASS news agency reported quoting a source in the Russian delegation. The Russian foreign minister arrived in Pyongyang on Thursday and held talks with DPRK counterpart Ri Yong Ho before meeting with Kim, according to the MFA. Following his meeting with Ri, Lavrov said Moscow was “ready to make its contribution” to trilateral economic projects with Pyongyang and Seoul. Russia was particularly interested in projects involving the construction of gas pipelines and railways connecting the two Koreas to Russia. “Leaders of the North and the South at their [April 27] meeting expressed interest in unifying railways networks,” the Russian foreign minister said in a statement carried by Kremlin-funded TASS news agency. “As a good neighbor of North Korea, Russia is ready to make its contribution to these efforts,” he added. Thursday also saw Lavrov and Ri discuss trilateral economic cooperation, Lavrov said. “Our Korean friends welcome this, so we have discussed some steps that could be taken to that end,” he noted. Putin in April expressed his hopes that a recent Moon-Kim summit would see the two Koreas expand trilateral cooperation on economic projects. President Moon in response expressed his hope that the three countries could conduct trilateral research on cooperation. In May, Beijing and Seoul also agreed to review plans and conduct research into the construction of a railway connecting Seoul, Sinuiju, and China. 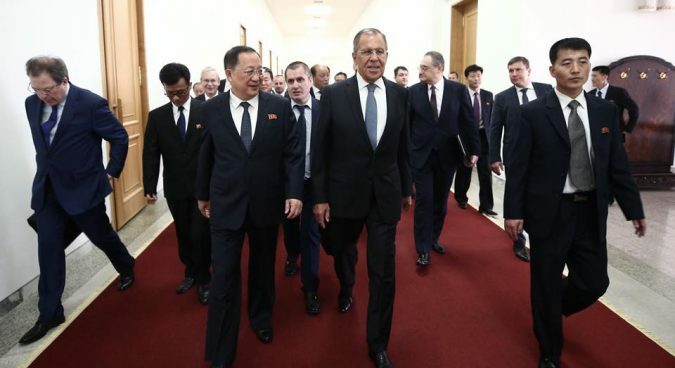 Thursday also saw Lavrov express his view that the North Korean nuclear issue would not be fully resolved until international sanctions against the country were lifted. “But how to move forward to this, that’s about the art of negotiators. But this cannot be done in one move,” he said, in a statement carried by TASS news agency. 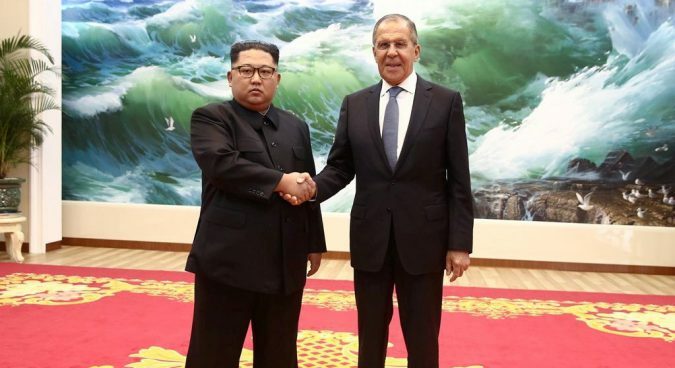 And in comments in stark contrast with demands by both Seoul and Washington for full North Korean denuclearization, Lavrov on Thursday expressed support for a more phased approach. “It is impossible in one move to ensure denuclearization, that’s why certainly there should be some stages and there should be the oncoming traffic at each of these stages,” he said. 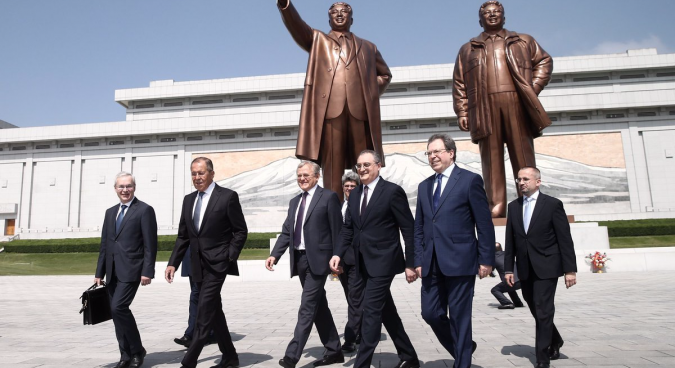 Lavrov’s visit to North Korea comes amid a flurry of diplomacy ahead of a previously-canceled June 12 summit between Kim Jong Un and U.S. President Donald Trump, set to take place in Singapore. That diplomacy has in the past week seen Kim Jong Un meet for the second time with South Korean President Moon and DPRK officials hold high-level talks with American diplomats. But it has in the past few months also seen the DPRK reach out to its traditional partners in Beijing and Moscow, with Kim holding two summits with Chinese President Xi Jinping and a meeting with the country’s foreign minister Wang Yi in Pyongyang.